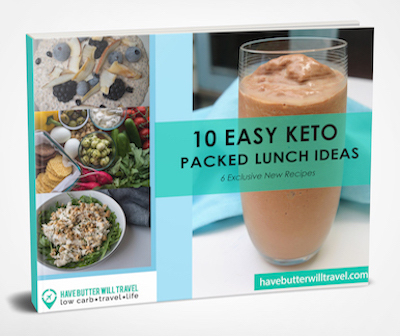 Keto taco salad is one of the easiest and quickest keto meals you can make. 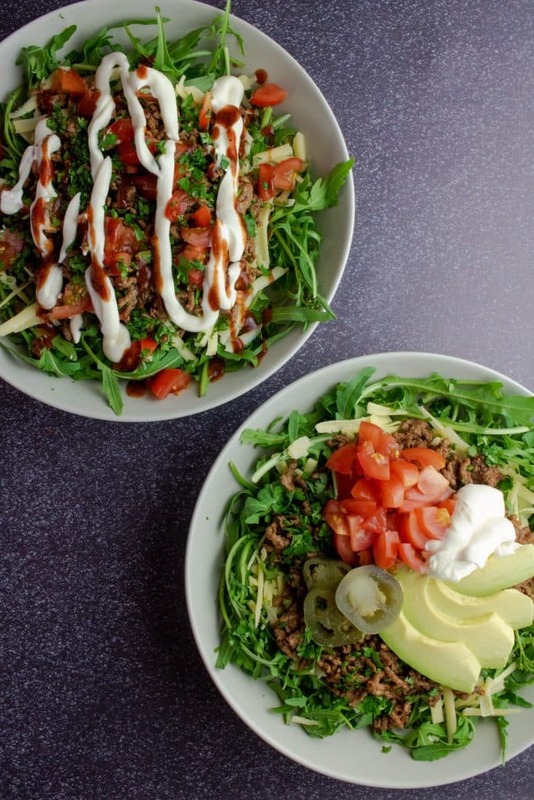 We love this keto taco salad recipe so much that we would have it for dinner at least once a week. It’s so easy to cook up a double batch of ground beef and you will have leftovers for the next day’s dinner. 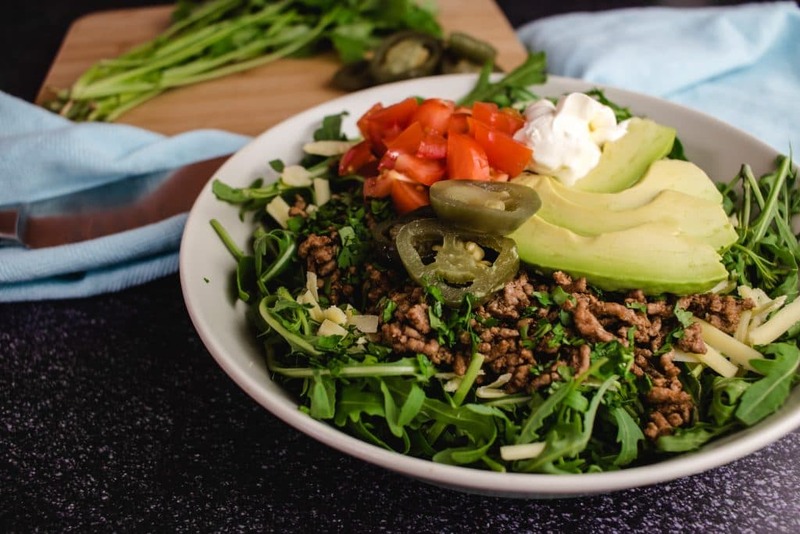 If you miss the flavours of tacos this keto taco salad bowl will easily satisfy your cravings. 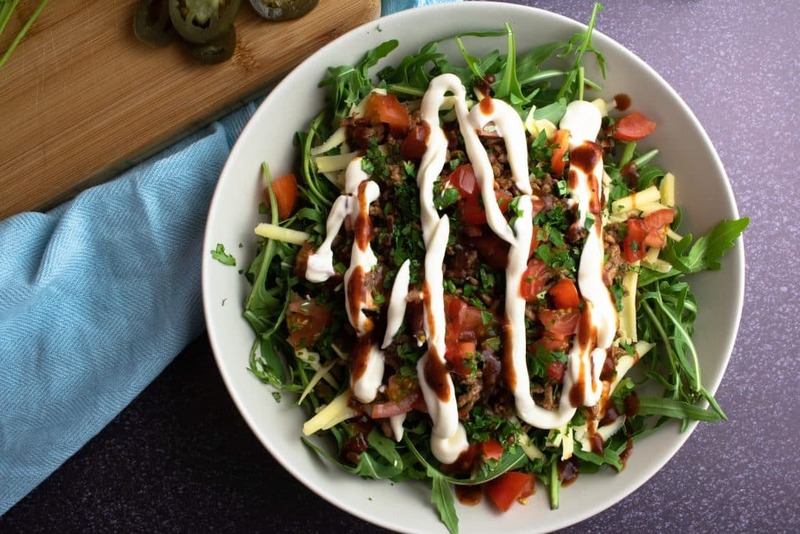 We also love the freshness that this keto taco salad offers with the rocket, tomato and coriander all adding bags of flavour. 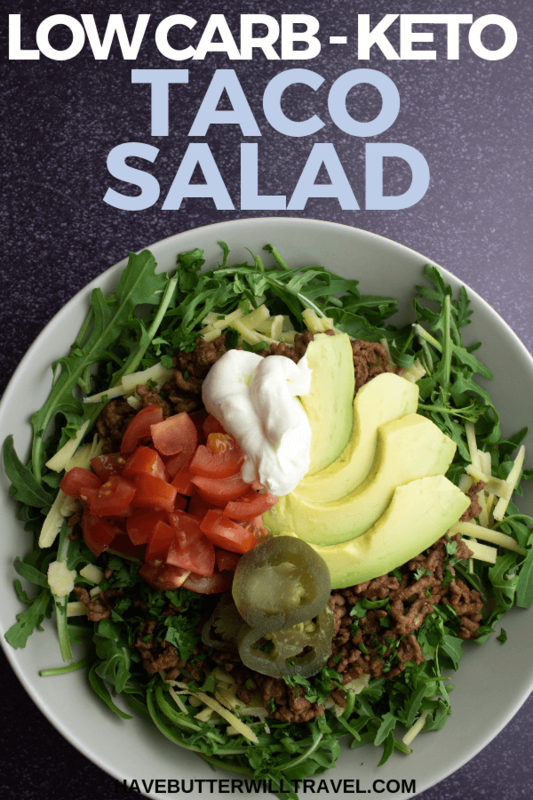 This keto taco salad recipe includes everything you would have previously put in your tortilla and turns it into a taco salad. This keto taco salad recipe is actually more tasty than the ‘Old El Paso’ tacos we all grew up having as kids. Those things are like cardboard and I definitely don’t miss them at all. The mince filling in this recipe is just as tasty and uses herbs and spices that can be found on most spice racks. The salad portion of this keto taco salad is the key. It’s so much nicer than those store bought taco shells. We just love the fresh combination of the rocket, tomatoes and coriander. Cook up a double batch of the mince/ground beef and use it for a second meal. You can use it in this keto cheesy taco omelette or another taco salad for lunch the next day. We love this low carb taco seasoning from Wholesome Yum. Always try and make a double batch and store it in a airtight jar. That way you always have some ready made in the pantry. 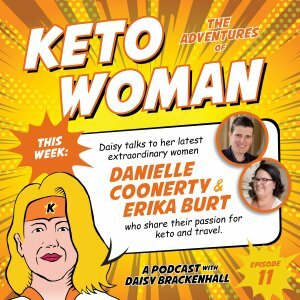 Our favourite sauce to use in this keto taco salad is hot sauce. Feel free to get creative with your sauces. You could also top your salad with ranch dip, guacamole pico de gallo or siracha. Prepare all of the ingredients before you start to cook the meat, as it cooks quickly and you will want the salad ready to be topped with the meat and cheese and then serve. 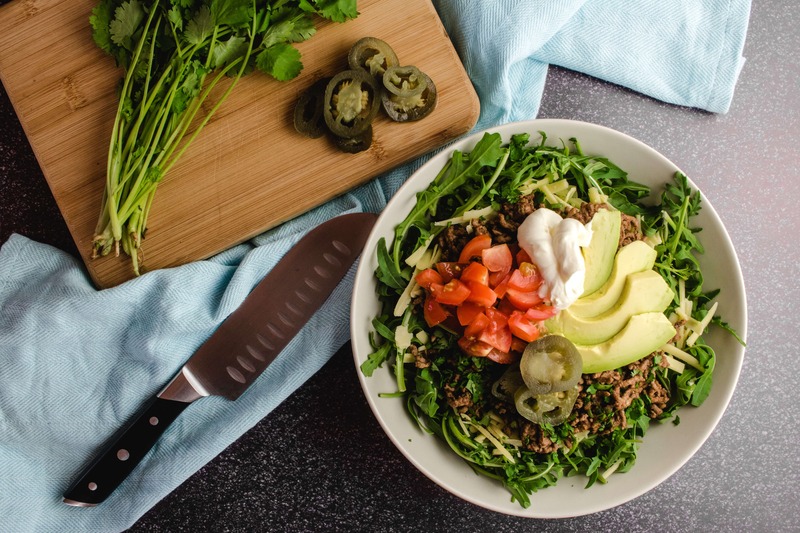 We love ground beef as our protein in this keto taco salad. 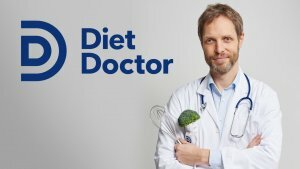 You could substitute the beef with pork, lamb, chicken or turkey. We also love to replace the ground beef with shredded chicken and cook the chicken with the taco spices. We love rocket/arugula and it is our preferred salad green. 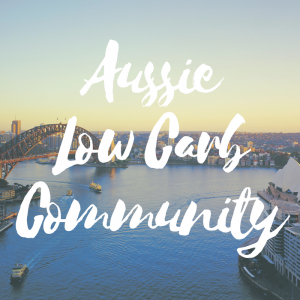 You can use any of your favourite salad greens. We also like spinach, beet leaves or chopped cos lettuce. This quick and easy keto taco salad recipe is the perfect weekday dinner. It pack full of Mexican flavours and the ground beef, cheese and sour cream will keep you satisfied. One of the best things about a keto taco salad bowl is the add ons. You can get really creative and choose your favourite Mexican add ons. Some of our favourites are sour cream, cheese, avocado and hot sauce. We find the cheese, sour cream and avocado are a great way to add fat to this salad. It is easy for a salad to lack enough fat to keep you full. You will have no problem if you add some of these as your add ons. 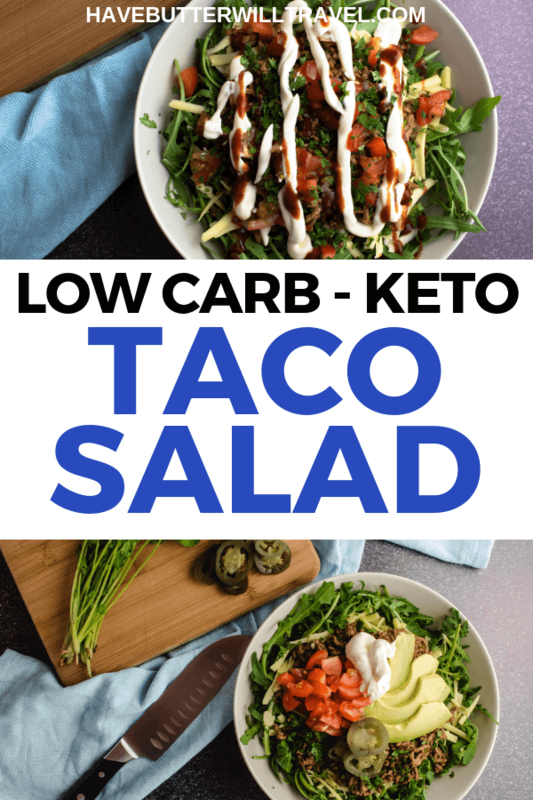 Keto taco salad is a perfect low carb dinner that is so quick and easy to make. Simply cook your ground meat and add to your favourite salad mix. Place the ground beef/mince in a large frying pan and cook on a medium to high heat until browned. Once meat is browned, add the taco seasoning and cook for a further 5 minutes. Divide rocket, tomatoes, ground beef, cheese, sour cream and coriander into 2 serving bowls. Top with your favourite optional extras and serve.